New Year’s Eve 2014, my friends and I went out to a bar featuring a live band, and we found ourselves clustered at the foot of the stage directly in front of the trombone player. It was probably the best spot in the the house to be, because, generally speaking, trombone players got game. I was inspired by his energetic shenanigans and showmanship, and deeply regretted growing up to not be a trombone player. I do, however, play the air trombone rather well, as pictured here, in the snazzy outfit I wore that night. Another selfie illo from the Rocked That Look series, found in my sketchbook, but not posted. Hey, remember when I rocked that look— i.e. 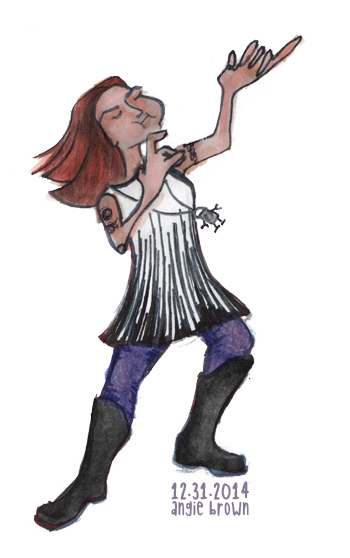 illustrated a short series of selfies + fashion illustrations + air guitars? Just wanted you to know that I didn’t stop, yo— I just slowed down. This one is from a few months ago; I’ve just run across it while flipping through my sketchbook, and I think it’s a keeper. It was a Friday, and a Good Hair Day. …I think I might wear this to work one day next week, with a cute sweater to cover my tattoos and also #becausecoldindatoffice. 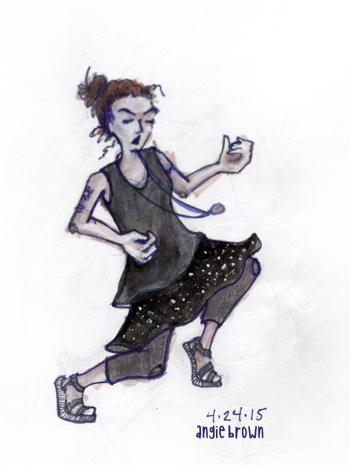 Got an #ootd illo blog on wordpress or tumblr? Hit me up with a like or comment so I can find you and we can be internet friends.